Book direct with us for the lowest rates ! With the calendar below you can see availability and make your online reservations for the jungle treehouse with instant confirmation. In case of no availability then we may have room for you in our other place; Rainforest Hideaway. You can also phone us on 07-40980108 with any questions and make your reservation, or email us with your questions. Rates for the Jungle Treehouse are $159.- p.n. for occupancy of one or two in the queensize bed, plus $15.-for an extra single bed. 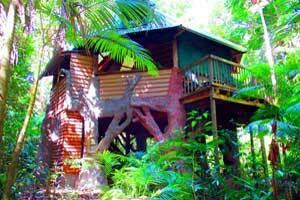 The treehouse sleeps a maximum of three adults, or two adults and a child. The single bed is only made when needed, so if you want a twin configuration please let us know, there is a charge of $15 for an extra bed. Rates include taxes, linen and towels, coffee, tea, etc. The jungle house has some basic cooking facilities, crockery and utensils, two wood fired barbeques to choose from, and there are several options nearby to eat out. Cape Trib shops are small with limited choice so for anything else than the basics shop at the IGA at the Port Douglas turnoff or Mossman Woolworths on your way up, the nearest big supermarkets with normal prices and availability. You are welcome to use our free Wifi between 10:00AM and 19:00PM up to 100 Mb per device per day and explore our rainforest sculpture trail. Jungle Treehouse not available on your dates? Try our other place ! To check in on arrival go to Rainforest Hideaway, 109 Camelot Close,Cape Tribulation, see some maps and directions. It is easy to find, sign posted from the main road, and shown on local tourist maps. Drive up Camelot Close until you see some large Easter Island Moai statues on your left. Jungle Treehouse too adventurous for you? Then try Rainforest Hideaway !